A rider skills improvement programme, developed by IAM Roadsmart (the UK's leading road safety charity), for any motorcyclist with a full licence who wishes to improve their riding skills. This is a core programme of rider skills enhancement designed to assess, explain and develop the individual's riding techniques to make you a safer, focussed and more confident rider. This will bring you to a standard that will prepare you for the advanced riding test. On passing that, you will become a full member of IAM Roadsmart. An Advanced Rider Course handbook (based upon the Police “Roadcraft” training manual). This will be used throughout your course as a reference guide. First year membership of the IAM RoadSmart. First year membership of CCAM. Examination cost covering your advanced riding test. How do I enrol on the Advanced Rider Course? The Advanced rider course is currently £149. When prompted to enter your preferred group, please enter "Cheltenham and Cotswold Advanced Motorcyclists group 1265" - this ensures that you are allocated to the C-CAM group (if you don't, it is allocated by IAM and you may not get allocated to C-CAM). You will be allocated to a local CCAM Observer who will take you through the programme designed to provide 'One on One' guidance. You and your observer will arrange observed rides at mutually convenient times, with rides usually lasting 2-3 hours each time. Generally, a total of 6-8 runs would be sufficient for the average associate. You can expect the programme to take 2-3 months to complete. The observed runs are conducted in an informal relaxed manner, and two-way dialogue is encouraged. As all IAM Observers are volunteers using their own bikes and time, we do ask that as an associate, you contribute towards your Observer's fuel costs. Once I have passed, what next? First and foremost, well done! Having passed the IAM advanced test, you are now entitled to full IAM membership and continued membership of CCAM. This will allow you to continue to access further riding skills development within the club, such as low speed control skill courses and off road/track based events where organised. You could of course consider becoming an Observer yourself within the group. Still not sure if the Advanced Rider Course is for you? 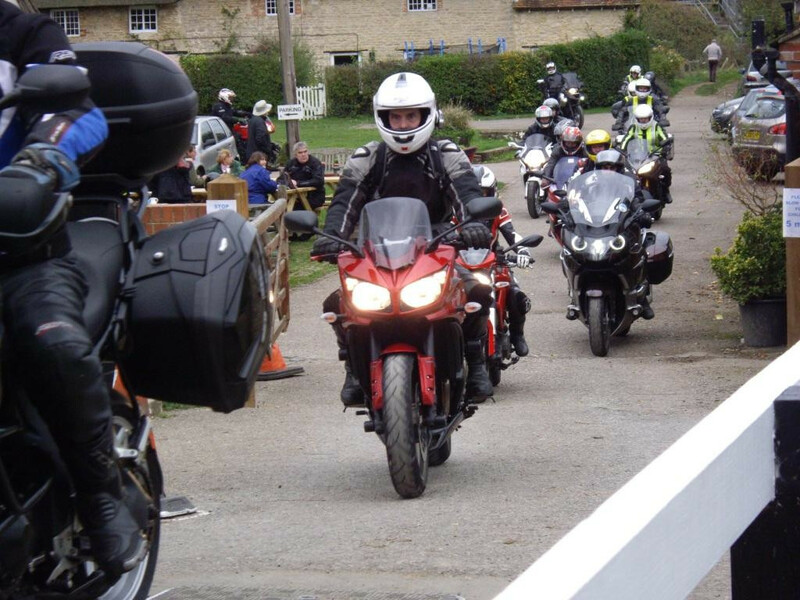 Then come along to one of our relaxed monthly meetings or take part in one of our ride outs (see events diary). You will be able to meet our observers who will be more than happy to answer your questions and perhaps any concerns that you may have. These notes provide some guidelines for Associates and Observers for CCAM observing. The guidelines are aimed to ensure that suitable progress can be made by both Associates and Observers. If any issues arise during observed sessions, or if there are difficulties meeting these guidelines, the first point of contact is the Associate Coordinator. It is expected that riders on CCAM rides (observed or otherwise) will wear appropriate kit; this includes boots (which cover the ankles), gloves, motorcycle jacket and appropriate trousers (and of course a legal helmet). The Motorcycle must be legal and Roadworthy. If the observing process is to work well it is essential that it is an uninterrupted process. The expectation is that normally rides are carried out at least every two weeks; ideally the next ride should be arranged at the end of each observed ride. It is appreciated that there are some occasions (illness, holidays etc.) this may not be possible, however if the time between rides extends to four weeks on more than one occasion the Associate Coordinator should be contacted. If the Observer/Associate feels that they cannot commit the time required for observing at this frequency they should withdraw from the process. The Associate Coordinator can then reallocate the Associate another Observer when they are advised that the Associate can commit to the process. There is no absolute time limit to the training period. However, if the guidelines above for regular rides are adhered to and the Associate practices what they have been taught between sessions, the course should be completed within 6 months, extending to perhaps 9 months if undertaken over the winter months. The Associate will then be entered for their test and the Observer can move on to another new Associate who may be waiting to start their 1-2-1 ride outs. If after 12 months the Associate is still not ready to take his/her test, then the Observer / Associate Observer Coordinator will discuss the best way forward. If it is judged that progress is still being made then, subject to Observer availability, the course can be extended. If however, the Associate has reached a level beyond which they are unlikely to progress, the course will be concluded. The Associate can continue their membership as a long term Associate member. In general rides should not be postponed for weather except in extreme cases (temperature below freezing, snow ice, gales etc. ), rides should not normally be cancelled for rain (unless torrential) at the discretion of the Observer. Please see the events diary for details of rides currently planned. This will give details of the starting time and where to meet.. It will indicate the rough destination, the length of the ride and an approximate time of return. Ride outs are led by experienced riders and follow to IAM Roadsmart guidelines. They may involve a long day in the saddle - or a gentle half day run to a local cafe or Pub for lunch. This will be stated in the ride out itinerary. We normally use the drop-off marker system which will be fully explained by the ride leader before departure. The leader will gather the group around at the start to give an outline of the day. You ride at your own comfortable pace. FULL TANKS at the start please. Finally, please remember to check our Web page or Facebook near the day, as often climatic conditions and personal issues can mean last minute changes.